In the modern day world, glass blocks have become part of almost every architectural design for both residential and office buildings. It provides added elegance to the look of a typical and ordinary space. With the versatility of glass blocks, numerous possibilities are made. Glass blocks can be used in many aspects. Among its many uses include walls. 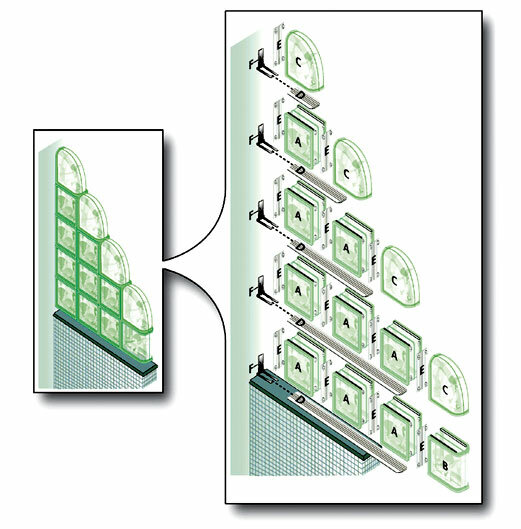 Glass blocks may serve as wall partitions or as a means of enclosure of a given area or space. Using glass blocks as walls create a certain uniqueness or twist which cannot be provided by ordinary wooden or dry walls. It is a good alternative since it enhances the whole look of a place. It is stylish and at the same time efficient in terms of energy savings. Glass block walls are translucent therefore allowing light to pass through. This is the reason why it is efficient in terms of electricity cost. It helps lessen the usage of electricity light since it allows natural light or light from another area to pass through or be reflected back while without disregarding privacy. The good thing about glass block walls is the fact that they are easily installed. Each glass block is simply stack on top of each other using either an industrial grade silicone or a masonry mortar. 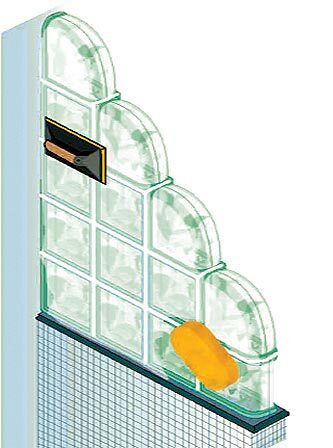 The only disadvantage of glass block walls however, is that they are not capable of supporting other structures since they are not made to be load bearing. Glass block walls can be designed in various ways. Glass blocks come in different sizes and patterns or designs. Common sizes of glass blocks are about six inches by eight inches or eight inches by eight inches. Glass block designs or patterns vary in terms of their color hints. Depending on creativity and boldness, all the variations of glass blocks may be combined together to create a unique glass block wall. Before installing, make sure the jamb (anchor wall) is plumb. Make sure the floor is flat, level, and at least 4′ wide (nominal thickness of the glass block) and 32” long. If installing in a wett environment, ensure the sill is waterproof. 1st – 31”, 2nd – 31”, 3rd – 23”, 4th – 15”, 5th – 7”. Trim one end of the spacers to fit the shape of the EndBlock or ENCURVE by cutting the two corners at a 45 angle 3/4” from each corner. Insert an anchor into the end of one of the 31” horizontal spacers and place it on the sill so that the anchor meets the jamb. DO NOT attach the anchor. Install a regular glass block on top of the horizontal spacer tight against the vertical spacer in the jamb. Continue alternately installing vertical spacers and glass block to complete the row, finishing with the EndBlock. Place the other 31” horizontal spacer with anchor inserted into tha jamb end, on top of the first row. Mark the location of the anchor V notch on the jamb. Note: This mark will be used to draw a plumb line on the jamb. Remove the top horizontal spacer, blocks and vertical spacers, being careful not to disturb the bottom horizontal spacer or shims. 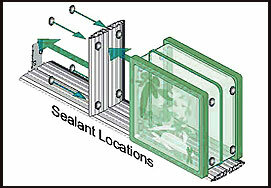 Apply two 1/4” beads of sealant to the sill 1/4” inside the traced outline of the spacers. Reinstall the bottom horizontal spacer, with anchor inserted, pressing it down into the sealant. DO NOT attach the anchor with screws. Line up three regular bloks and one EndBlock to install on top of the horizontal spacer. Apply two 1/4” beads of sealant across the top of the blocks, just behind the raised edges. Install the first block with the sealant beads down. Push the block firmly against the jamb and sill. Continue installing vertical spacers and glass block in this manner to complete the first row. Apply two 1/4” beads of sealant on top of the first row of blocks, just behind the raised edges. Install the second 31” horizontal spacer on top of the first row of block, with an anchor inserted into the jamb end. Make sure the spacer fits firmly on the glass blocks. Press the spacer down onto the sealant. Align the V notch in the anchor with the plumb line drawn on the jamb, and attach the anchor using the screws provided in the anchor pack. Remove any excess sea;ant from the horizontal and vertical joints. Adjust the size of sealant beads to prevent squeeze out (keep joints area clean of sealant). Do not change the location of the beads of sealant. Line up three regular blocks to install on top of the horizontal spacer and apply two 1/4” beads of sealant across the top of the blocks, just behind the raised edges. Install the glass blocks and vertical spacers in the same manner as the first row, alternating vertical spacers and blocks. Finish with a vertical spacer, with sealant dabs applied facing the ENCURVE location. Install the ENCURVE by applying a 1/4” bead of sealant to what will be the bottom edge of the block, just behind the raised edges. 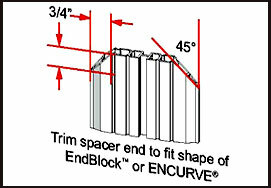 Install the ENCURVE with the sealant beads down on top of the horizontal spacer, and tight against the vertical spacer. Install the remaining rows in the same manner: 3rd row – two regular blocks and one ENCURVE.